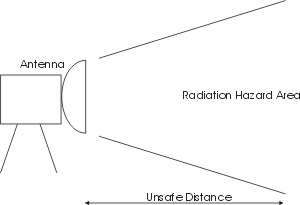 Radiation Hazards exist where ever any transmitter is radiating into any space. Just because an antenna is outdoors does not diminish the amount of radiation leaving the antenna. In order to measure the radiation out of an antenna we use an isotropic probe and calibrated meter. It's worth pointing out to those of you who don't know, that this type of radiation is not nuclear. It is radio frequency radiation (RF) and as such is totally different. The effect it has on the human body is difficult to say as no long term studies have yet concluded any meaningful data. The safest way to work with RF radiation is to avoid it. Never stand in front of any radiating antenna. Even a mobile phone radiates power and should not be over used. The generally accepted view is that a small amount of exposure has no lasting effect and I have often been told that a family could have a picnic every day for a year in front of a VSAT before any damage would occur. I won't be testing that theory. New technologies bring yet more radiation, such as Wireless Network and Bluetooth transmissions. The power radiated depends on the distance from other transmissions as a longer distance requires more power. Also, transmitting through walls and other objects attenuates the signals requiring more power to make the link. Measuring these signals is not straight forward as they are often bursts of transmissions rather than constant signals so an average power is required to be measured over a long period in order to determine the radiation level. Peak power signals are not as likely to cause harm as the longer term average power levels because they may only be present for fractions of a second. A lot of paranoia has built up regarding such radiation as being dangerous. The truth is that the risk is unknown but is unlikely to be as dangerous as some might say it is. For years there has been a risk from overhead power lines, radio and television transmitters, radar, satellite, digital terrestial links, microwave ovens and now mobile phones and wireless networks, even bluetooth. All of these things are sorrounding us in radiation. Remain behind satellite antennas and minimise your exposure to the other transmissions and there is hopefully no problem, use your common sense. Health and safety has led to common sense being ignored in some cases. However, just to make it clear that we encourage safety we have created a sign which is free to download and stick on or around your antenna. This will warn the public or anyone near the antenna that there is the invisible risk of harmful exposure to RF radiation if they stand in front of the Transmitting antenna. Using our probe, on a long stick if necessary, place the head of the probe at the focal point of the antenna and slowly move it away from the antenna along the axis of the beam. The highest reading on the meter is the maximum power per cm squared. The recommended safe level is regularly revised. I recommend 1 mW per cm squared or less to be on the safe side. When I started in this industry the safe level was 10 mW and walking in front of antennas was common place. Since then things have changed and fences and warning signs are the order of the day. For a particular antenna the power will fall below the safe level after an unsafe distance has been exceeded. This means that a secure area can be set up to prevent access inside this distance from the front of the antenna. For satellite antennae that point skyward this distance is reduced because the beam is travelling up and away from the ground. The antennae that point along the ground such as line of sight antenna do not have this reduction. Radars are often overlooked in this matter and infact use much higher power levels. They are usually pulse power systems transmitting very high power levels for only a fraction of a second but repeatedly. These systems are still dangerous and should not be approached too closley. The safest thing to do is make sure that no body has physical access to the immediate fron of the antenna no matter which way it points. Use a physical barrier to prevent this access upto a distance from the antenna determined by a radiation hazard inspector with his meter and probe. These distances can be as much as 30 m from the antenna. How many times have you seen that done? Every transmitting terminal should have a certificate which not only details the type of transmitter, operating frequency and power but also the safe distance that should be kept in front of the antenna. Fence off the area and use warning signs then there is no risk to anyone. HOW SAFE ARE SATELLITE ANTENNAS? Although many satellite-earth stations are "fixed" sites, portable uplink antennas are also used, e.g., for electronic news gathering. These antennas can be deployed in various locations. Therefore, precautions may be necessary, such as temporarily restricting access in the vicinity of the antenna, to avoid exposure to the main transmitted beam. In general, however, it is unlikely that a transmitting earth station antenna would routinely expose members of the public to potentially harmful levels of RF energy. 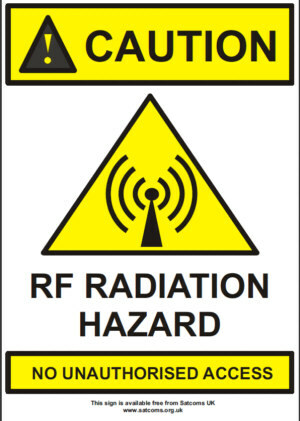 Click Here to download the PDF format RF Radiation Hazard sign - free from Satcoms UK.